Pursuing University Education from a foreign country is a dream of many students. Sometimes its a particular course that attracts International candidates and sometimes its just a plain wish to catch a first flight to foreign shores and learn in a completely different settings. The Universities in Italy provides higher education in different academic areas, viz; Arts; Humanities; Science, Technology, Engineering and Mathematics (STEM), Computer Science, Architecture, Medicine etc. 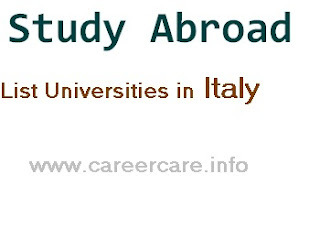 To help students of International community who wish to migrate to Italy for any reasons whether as a choice or compulsion here given list of Universities in Italy. Free University "Maria Santissima Assunta"
Free University Institute "Carlo Cattaneo"
University Institute of Teacher Training "Suor Orsola Benincasa"
University of Roma "Tor Vergata"